The summer months can be very irritating for some pets. It gets too hot and there is nothing they can do to get comfortable. To avoid stress cause by heat, here are some things you can do to brighten your pet’s days during the summer months. Dog breeds with longer hair and breeds with shorter snouts are prone to heat stress most. Provide clean and cool drinking water that’s placed near some shade. It is never a bad idea to place several bowls of water, and space for your pet to walk around in the shade. Even placing a chair for your dog or cat to lay under helps provide a shade. Excessive exercise should not be permitted, and go out during the cool parts of the day instead. 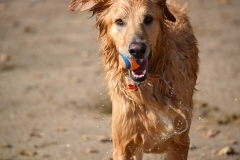 Take a break from your pet’s fitness on very hot days. Never leave your dog along in the car, no matter how long you’re gone. Opening the window does not help cool down your pet as efficiently as you might think, this is very dangerous. This also stops potential calls made to the police, and hearing your license plate number on an announcement around stores your visiting. If you believe your pet is experiencing heat stress, get him out of the hot environment and spray some cold water or wrap him up in a cold towel, and fan him down. Visit the vet immediately after. Signs of heat stress can include: excessive panting, drooling, red OR pail gums, vomiting and diarrhea as well as seizures and collapsing. Dogs and cats can’t sweat to lose heat like humans can. They can’t regulate their temperature for this reason, and therefore, they pant. We all need a break from the sun time and time again throughout the day.